Update: Congratulations to Christy D. on winning this giveaway! So you might have read about Jess’s packing snafu for our past weekend trip. Well unfortunately I didn’t do much better, which explains the lack of post this week. But never fear, Giveaway Friday is still on as scheduled — and we’ve got some exciting goodies for you guys to win this go around. 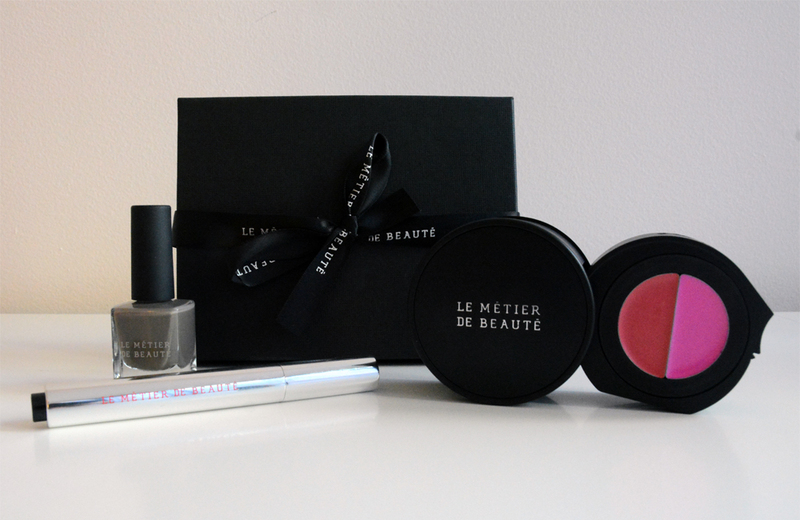 One lucky reader will get their very own beauty kit from Le Metier De Beaute containing: Obsidian Odyssey Lip Kaleidoscope (an amazing 8-in-1 lip color set), Lueur Stylo Brightening and Highlighting Pen in shade 2, and the Nail Lacquer in Tres Taupe. Read on to find out how you can win. All task entry below is optional; do as many as you like. The more entry you complete, the higher your chances are to win. Sweepstakes begins Friday, April 10, 2015, at 12:00 a.m. EST, and closes on Friday, April 17, 2015, at 12:00 a.m. EST. Love to try this brand. Esp the brightening pen! It would be a useful packing and it may be good giveaway! I love the Lueur Stylo Brightening and Highlighting Pen. I’m most excited about the Lip Kaleidoscope. Just look at those pink hues… I love it. Beautiful post and great giveaway. Most definitely excited to try the Lueur Stylo Brightening and Highlighting Pen. The Obsidian Odyssey Lip Kaleidoscope is the one I’m most excited about. GORGEOUS colors! I’m most excited to try the Lueur Stylo Brightening and Highlighting Pen. I’m excited to try the Obsidian Odyssey Lip Kaleidoscope the most. I’m always looking for some new lip shades. I would be excited to try the Lip Kaleidoscope. I love your blog! Your style is amazing! I would love to try the Brightening & Highlighting Pen….sounds great! I would love to try the Obsidian Odyssey Lip Kaleidoscope. I would like to try the nail polish! 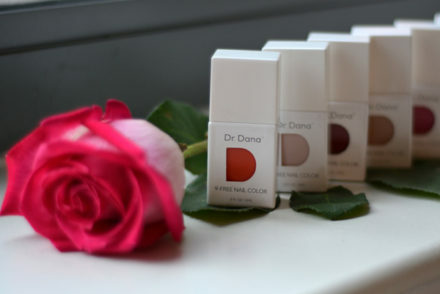 I would like to try the nail polish… the color is very unique! I am falling in love with the Lip Kaleidoscope. I would love to try their lipglosses!!! I am excited to try the Obsidian Odyssey Lip Kaleidoscope. I AM HOPING TO TRY THENAIL LACQUER IN TRES TAUPE, THIS SET IS A GREAT GIVEAWAY !!!! THANKU SO MUCH !!!! Obsidian Odyssey Lip Kaleidoscope with 8 different shades sounds awesome. Would love to get it a try. 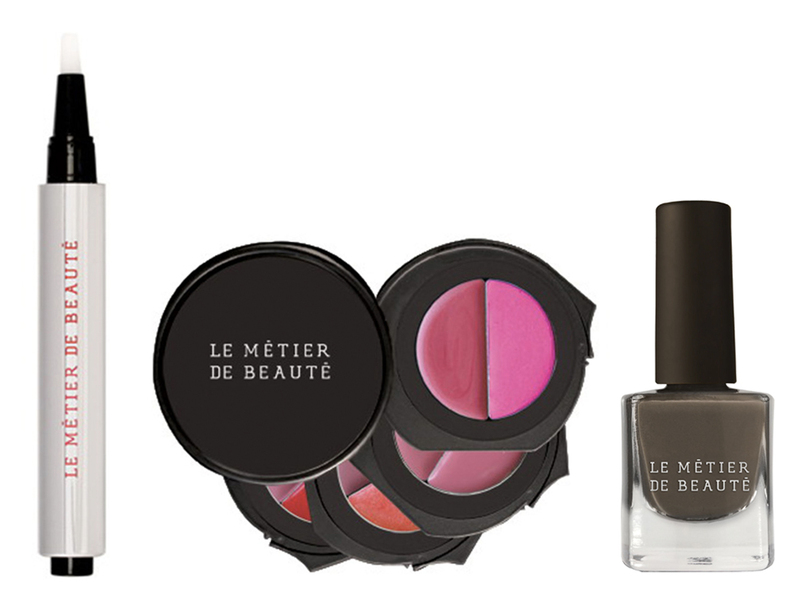 I would like to try the Le Metier de Beaute Limited Edition Obsidian Odyssey Lip Kaleidoscope. I like the Lip Kaleidoscope. I would love to try the nail polish but I love the hole kit. I’m most excited about the lip kaleidoscope. I’ve become hugely addicted to good lipsticks lately. The lip kaleodiscope! I love the look and have heard great things about LMDB! I want most to try the Obsidian Odyssey Lip Kaleidoscope. It looks wonderful! I’m most excited to try the highlighting pen. I definately want to try the Obsidian Odyssey Lip Kaleidoscope. I am so excited to try the Nail Lacquer. great giveaway, thanks, I am most excited to try the brightening and highlighting pen. really need this. The Lip Kaleidoscope looks amazing!!!! I’d love to try the lip color set-that looks incredible! I am most excited to try the Lip Kaleidoscope. So many great colours with which to experiment. I am most excited to try the Nail Lacquer in Tres Taupe. It is a pretty color. I am most excited about the Obsidian Odyssey Lip Kaleidoscope. I would love to try the Lueur Stylo Brightening and Highlighting Pen. The shade of the nail polish looks amazing too! Lueur Stylo Brightening and Highlighting Pen sounds nice! I would be most excited about the eye brightening pen. Thanks so much. I really want to try the nail lacquer. I don’t have a color like that in my collection. I am looking forward to trying the lip kaleidoscope; I love have choices when is comes to lip color. The Lueur Stylo Brightening and Highlighting Pen for sure. The Obsidian Odyssey Lip Kaleidoscope. It uses really interesting and unique packaging, and I like the idea of all of those lip colors in one compact. There is definately a lot tto find out about this subject. I’m most excited about the Obsidian Odyssey Lip Kaleidoscope. I’m most excited to try the nail lacquer. I am really excited for the Obsidian Odyssey Lip Kaleidoscope as well as that pretty nail polish! I am most excited to try the nail polish! Love your site! I am most excited to try the Lueur Stylo Brightening and Highlighting Pen. Thanks! I want to try the Lip Kaleidoscope . I would love to try all of it! I’m looking for new makeup to use in general and this stuff looks awesome!! I would love to try the highlighting pen, those always come in handy! The Lip Kaleidoscope makes me dizzy with desire! I am most excited to try the Obsidian Odyssey Lip Kaleidoscope! Oh-and the highlighting pen looks great.Just trying out highlighting and need one! I’m excited about the Lueur Stylo Brightening and Highlighting Pen. I would like the Obsidian Odyssey Lip Kaleidoscope. I am most excited to try their Lueur Stylo Brightening and Highlighting Pen. I ‘d love to try the Lueur Stylo Brightening and Highlighting Pen. My wife would love it if I won this. She would to have the Obsidian Odyssey Lip Kaleidoscope. I’m excited about the lip color set! I’m most excited for the Limited Edition Obsidian Odyssey Lip Kaleidoscope! It seems like such a handy little set!